Managed honeybee population stocks are declining in many countries, worrying scientists, the public and politicians. This decline affects us all, as it poses a risk to food security. Honeybees can be moved where needed and are not picky about the flower they visit to collect pollen and nectar which they feed on. Thanks to these qualities, they are the major crop pollinators relied on by humans. The honeybee equals and sometimes surpasses all other wild pollinators for this task. In the last decade, many studies focused on honeybee health to identify the causes of unusually high colony losses. Most of this work has been performed in Europe and North America where bees are exploited in large scale commercial operations. 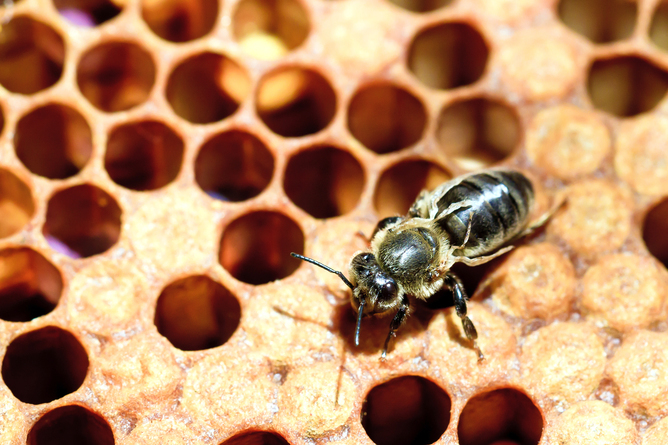 Scientists observe interactions of many factors affecting honeybee health. But these results are so far not sufficiently clear to understand the causes of the declines and implement adapted mitigation measures. Scientists and beekeepers will first need to understand the reasons for deaths amongst bees before they can adjust their practices to ensure the stocks’ survival. Honeybee health status or even basic data of population sizes in the wild before the modern beekeeping area is unknown. We lack important information to evaluate the severity of the current problem. Understanding how bees deal with pests, pathogens and other environmental factors in Africa, where beekeeping has not been as intrusive, could help scientists understand more about why the bees of Europe and North America struggle. How can African honeybees help? The honeybee, Apis mellifera, is also present in Africa. In contrast to the docile European honeybees, African honeybees are more aggressive to beekeepers and are rarely confined to man-made hives. The majority of their estimated 310 million colonies strong population is wild and lives in natural cavities in trees or ground. 1. Is it possible that by developing beekeeping to the current industrial level, we pushed the honeybees to their biological limits? When managing these pollinators, do we place them in such unnatural situations that they are weakened? 2. Was the selective breeding used to improve desirable traits such as honey production or docility done at the expense of their defence mechanisms? 3. Does the wide scale honeybee trade result in the spread of damaging pathogens to which the honeybees are not adapted? By studying African honeybees in their unique context, we could obtain the answers. Recent health surveys indicated that honeybee populations in South Africa, Uganda, Kenya and Benin are indeed healthy. Pathogens, either endemic or imported, are present but do not at this time seem to generate unusual and widespread mortality. A notable exception is the damage done by a certain honeybee. A particular honeybee lineage originating in the Cape region in South Africa functions as a social parasite. To promote its own reproduction, this parasitic honeybee invades colonies of other subspecies and exhausts their resources until they dwindle to death. Tens of thousands of managed colonies in the hands of the beekeepers have been lost to this parasite, while the wild populations still living in natural nests fortunately seem spared. This means that beekeepers are seen as the vectors of the parasitic bee as it largely affects managed honeybees. This phenomenon is one example of an unexpected and negative consequence of trade involving the displacement of a subspecies of bees from their natural distribution range. The huge numbers of bees being traded all over the word exposes them to numerous diseases. In contrast, the invasion by the most damaging honeybee parasite, the well named miteVarroa destructor, does not show the same long term devastating effect on some African honeybee populations. Researchers are very interested in identifying the tolerance mechanisms of the honeybee populations able to survive infestation without treatments. Selective breeding of the responsible behavioural or physiological traits could help the currently susceptible populations survive in presence of the parasite. Control efforts of the past decades have not resulted in parasite eradication and new methods are required. Honeybees that can live in the presence of this mite without human intervention are the Holy Grail for many scientists and beekeepers. The African honeybee populations have so far largely coped with the arrival of new parasites and pathogens. But measures should be put in place to maintain their apparently healthy status. Beekeepers should work with local honeybee populations and refrain from importing colonies from distant places. Despite the general positive situation, worrying signs of declining populations have recently been reported in Madagascar, Kenya and South Africa. This is where colonies succumb to the newly arrived varroa mite or where beekeepers have increasing difficulty trapping wild swarms to build their stocks. Africa would benefit from the mistakes made elsewhere by preventing such problems through the protection of honeybee populations. Before the states establish rules and restrictions, better information for the primary stakeholders are needed. Beekeepers play a vital role. They can help keep African honeybees healthy. The African honeybee could be a major tool for researchers and beekeepers if they want to learn about conserving the western honeybee. Visit the Elsevier Store to access books on entomology, animal science and much more! Use discount code “STC215″ at checkout and save up to 30%!